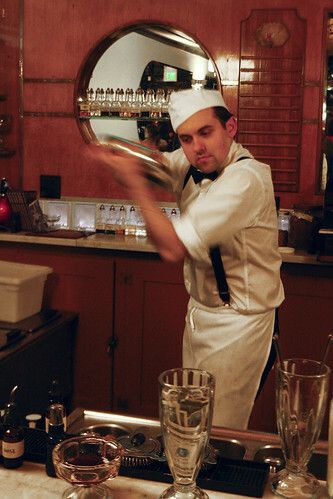 Ice cream bartender, Chris Simpson, prepares a drink in a fashion that a traditional bartender would at the brand new Ice Cream Bar shop in Cole Valley, Friday, Jan. 27. Photo by Mihail Matikov. With an authentic soda fountain nicknamed Dandelion and 1930s jazz and swing playing in the background , the recently opened Ice Cream Bar provides a distinct, vintage offering of house-made sodas and ice cream in Cole Valley. Owner Juliet Pries, who got her first ice cream maker when she was 6 years old, said the menu contains recipes from the prohibition era. Pries designed everything else around streamlined deco, from the interior to their old-fashioned appliances, she said. Pries read numerous reprints of old manuals about soda fountains in order to create an accurate late-1930s look and feel to the restaurant. With some help from consulting mixologist Russell Davis, who is a bartender at Rickhouse in the Financial District, the Ice Cream Bar boasts a hefty drink menu complete with over 75 tinctures and fountain syrups ranging from usual flavors like vanilla and cherry to more adventurous flavors like sassafras and candy cap mushroom. “We combine state-of-the-art techniques with old-fashioned style to provide you with a one-of-a-kind experience,” said Davis. By using newer techniques like nitrogen cavitation, which is used as a hastened method for infusing flavors of dried herbs and spices into a tincture, Anne Sauer, an employee at the Ice Cream Bar, said that a customer can request any off-the-cuff custom drinks they want. Other menu highlights include their malts and milkshakes, which are shaken with milk, egg yolks and ice—not ice cream, unlike the traditional recipe. The Too Good To Be True contained Pries’s house-made rye butterscotch syrup, two egg yolks, milk, malted cream and blackstrap molasses all shaken in a tin cup. Thinner than the traditional milkshake, but just as rich. The ice cream selection didn’t disappoint either: Roasted Pineapple had just the right chunky, yet smooth consistency; Sicilian Pistachio was creamy and nutty; but Butterscotch was undeniably my favorite with its simple, no-fuss, sweet flavors. 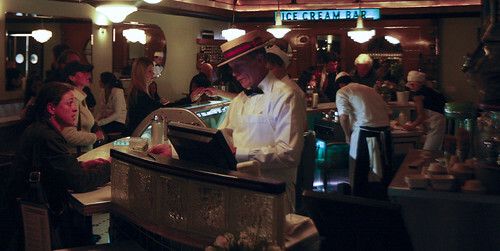 The Ice Cream Bar oozes with innovation, yet pays homage to art deco and the prohibition era. If you haven’t heard of panacea, phosphates or lactarts, now is the time to indulge in these tasty, made-from-the-base sodas. “I just want customers to experience having (drinks) mixed here, or having somebody make something in front of you with natural flavors,” said Pries. General Manager Tat Starsnick helps a customer at the register while others wait in line to be served at the newly opened Ice Cream Bar shop in Cole Valley, Friday, Jan. 27. Photo by Mihail Matikov.